SpotIM Messenger Password Recovery can find and decrypt the passwords of most popular Instant Messenger programs. SpotIM Messenger Password Recovery recovers lost or forgotten passwords for ICQ, Trillian, Miranda, RnQ, Camfrog and Easy Web Cam accounts. SpotIM is the best Instant Messenger password finder that instantly cracks and decrypts the passwords stored on computer. All major protocols are recognized (ICQ, AIM, MSN, Yahoo, Jabber, IRC). ...... SpotIM Messenger Password Recovery is the best Instant Messenger password finder that instantly cracks and decrypts the passwords saved on computer. 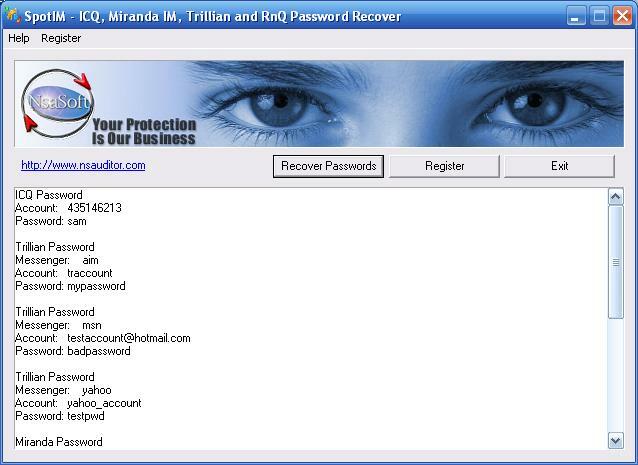 Instant Messengers Password Recovery Master 1.0.0. Displays logins and passwords for instant messengers accounts. Qweas is providing links to SpotIM Messenger Password Recovery 1.9.3 as a courtesy, and makes no representations regarding SpotIM Messenger Password Recovery or any other applications or any information related thereto. Any questions, complaints or claims regarding this application SpotIM Messenger Password Recovery 1.9.3 must be directed to the appropriate software vendor. You may click the publisher link of SpotIM Messenger Password Recovery on the top of this page to get more details about the vendor.